Choose the layer from the Layers panel and/or make the selection you want to fill with a pattern. Make your selection on a new layer above the image for more flexible editing later. Choose Edit→Fill Selection or Fill Layer and then select Pattern from the Use drop-down menu. Click the arrow next to the Custom Pattern swatch and then from the Custom Pattern drop-down panel, select your pattern. Choose any other fill options you want to apply, such as Mode, Opacity, or Preserve Transparency. 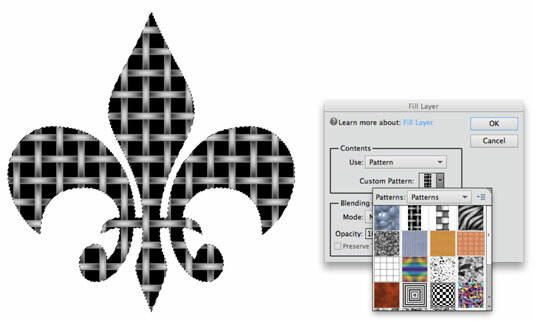 The Preserve Transparency option prevents Elements from filling the transparent areas on your layer with a pattern. If you choose this option on a new, blank layer, nothing is filled. Adjust the Mode and Opacity settings in the Layers panel rather than in the Fill Layer dialog box. This approach allows you maximum flexibility if you want to make edits later. Click OK to fill the layer or selection with the chosen pattern. Replace the current patterns with new patterns by selecting Replace Patterns from the panel menu. (Click the right-pointing arrow on the right side of the panel.) Then select the new pattern library from the dialog box that appears. Append new patterns to the current set by selecting Load Patterns from the panel menu.